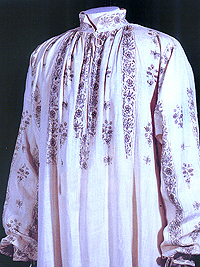 When Janet Arnold died in 1998 the world of historical costuming was shocked to think that was the end of her career. But we were wrong, it was not the end. Not only had Arnold published seven books and dozens of magazine article, conference papers, and contributions to exhibit catalogs, but she had established a methodology for examining and recreating period garments. No costumer's library is complete without her works and many costumers see her as a friend. So when a new book by Janet Arnold was released in October of this year it created a tremendous stir. Janet Arnold was born in England in 1932. Like many of her age, the war years gave her a great appreciation for the details of life, and especially the details of clothing. She never received an advanced degree in the history of clothing, but eventually she was the most sought after speaker at costume conventions and historical conferences. She began her career as an art teacher. Her love of sewing led her to working in the costume department of several theater companies for 10 years, where she began studying historical garments and making detailed drawings for her own research. Later, while she was teaching costuming, these drawings and her lectures became the basis for her first book, Patterns of Fashion 1, which was first published by Wace in 1964.
similar to the others in the series. Patterns of Fashion 1: cut and construction of women's clothing, 1660–1860 was followed two years later by Patterns of Fashion 2: cut and construction of women's clothing, 1860–1940; but, it wasn't until they were republished in 1972 by Macmillan that she began to draw attention from museums and curators around the world. In the meantime, she published more books on Queen Elizabeth I, including 'Lost from Her Majesty's Back' (The Costume Society, 1980). During this time she earned a national diploma of design and dress and taught costume design. Out of this work came Perukes and Periwigs (HMSO, 1970), a booklet on the development of wig styles in paintings at the National Portrait Gallery, London, and A Handbook of Costume (Macmillan, 1973), a guide to the primary sources for costume study. The third book in the Patterns of Fashion series actually was a prequel to the others. Patterns of Fashion: the cut and construction of clothes for men and women 1560–1620 , was released in 1985 and instantly became the bible for Elizabethan fashion. I can recall how we poured over every picture and drawing when it first came out. There was something so exciting about seeing the insides of garments for the first time. Arnold showed the details that other affordable books never thought important enough to show. There were details of gussets, seams, padding, pinking, and embellishment that we had only been able to guess at before. But something was missing. She hinted at an upcoming book on linen clothing, but years passed without its appearance. 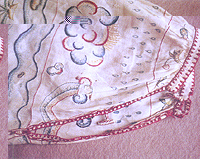 In 1988 she published Queen Elizabeth's Wardrobe Unlock'd, a study of the clothes worn by Queen Elizabeth I based on portraits, warrants for the Wardrobe of Robes, and other material. It included a full transcription of the inventories of the Wardrobe of Robes prepared in 1600, preserved in the British Library, Public Records Office, London, and the Folger Shakespeare Library, Washington DC. For the next ten years she consulted with many museum curators and collected information and photographs for her book on linen clothing. Unfortunately she died before she could finish her work. instructional as well as beautiful. After her death, Santina Levey, Arnold's biographer and literary executor, in colaboration with her devoted student Jenny Tiramani, began the hugh task of finishing Patterns of Fashion 4. They found that Arnold's vision for the book was clear, but it need to be organized clearly and put into a publishable format. After arranging all of the material that Arnold had amassed, Tiramani and Levey edited out duplicated information and standardized the presentation. Where there were gaps, they found the missing information in Arnold's other writings. In this way they were able to make sure Patterns of Fashion 4 would continue to speak in her voice as much as possible. Though Arnold had completed all the drawings and the measurements for the patterns before her death, the actual pattern drafting still had to be done, some garments had to be re-photographed, and permissions acquired. are shown in excellent detail. As they readied the book for publication, Macmillan informed the editors that they would be printing the book in color for the first time in the series. This greatly pleased Tiramani and Levey since they knew that it had always been Janet Arnold's wish to see the books in color. Color would add so much more life to the photographs of the clothing and the historic portraits. Finally, on the tenth anniversary of Janet Arnold's death, her last book has been published. Her fans have been waiting more than 20 years for this work and will not be disappointed. From the first few pages where Arnold describes the tools and techniques used to cut, sew, and embroider linen, to the final pages which are filled with scale patterns and hand-written instructions, Arnold's hand is evident. She is your old friend who has returned with gifts for you. 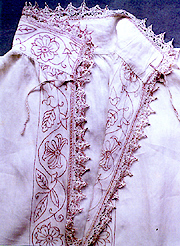 Arnold not only covers Elizabethan and Jacobean shirts and smocks, but caps, collars, ruffs, cuffs, bibs, tuckers, gloves, stockings, and best of all breeches for women to wear under their gowns. There are also examples of baby's clothes. 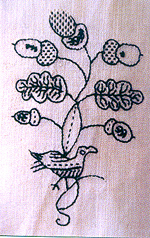 Needle workers in the SCA will be excited by several examples of embroidered pelicans in their piety. The section on neckwear—collars, ruffs, supporters, and rebatos—is especially well reserarched. 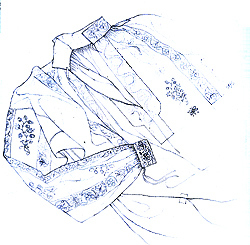 You will find yourself inspired to construct your own Elizabethan shirt of smock after studying the pictures, text and drawings. As always, Janet Arnold makes you feel like you can do it with her guidance. If you want to add this article to your list of favorites or email it to a friend, please use this permanent URL, https://stores.renstore.com/-strse-template/0810B/Page.bok. Permission is granted by the author to quote from this page or use it in handouts as long as you include a link back to Renstore.com.